In July of 1999 Owen and Kerri took a trip out west that included Jackson Hole, Yellowstone, and Salt Lake City. 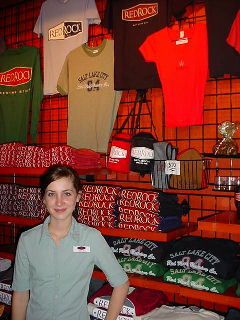 These are some quick thoughts on some of Salt Lake City's beer spots that were visited (with a few updates that were added in December, 2004). Outdated laws in Salt Lake prevent brewpubs from making beers with more than 3.2% alcohol by weight. As a consequence, most of the beers here are pretty light-bodied. This list is not comprehensive. Drop Owen an email to let him know your reviews of each spot. 273 Trolley Square, ph: 801-521-8917. Open since 1995, Desert Edge is a fun brewpub in the Trolley Square shopping complex near downtown. 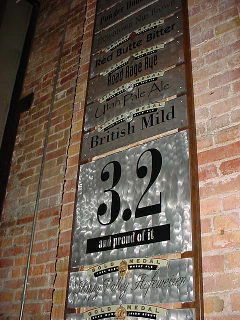 The brewpub had these beers on tap when we last visited in 2004: Pub Pilsner (clean, floral and nice), Happy Valley Hefeweizen ('96 GABF Gold Medalist), Utah Pale Ale (nice hop flavor), Road Rage Rye (spicy rye flavor), and Latter Days Stout (a good dry stout). Seasonal brews are also offered, and the beers are all very impressive for having such a light gravity. The food is delicious with spicy sauces and a southwestern flare. 1061 E. 2100 South, ph: 801-463-9393. This enjoyable beer bar had 32 beers on tap, around 10 beers or so in bottles, pool tables, dart boards, and a nice patio. Ask for a tiny sample of each draft beer before you order a full glass, as some of the beers might be stale. Also ask for your beer to be poured in a room temperature glass! The menu looked to be very interesting too. 254 S. 200 West, ph: 801-521-7446. Honey Wheat: Honey and grain flavors are very clean. Pilsner: Clear, hoppy, and malty with a hint of fruit. Hefe-weizen: Mild in flavor - more like an American Wheat Ale. Blonde Ale: Very mild and clean. English Mild: Golden English ale with light malt flavors. Amber Ale: NW American hop aroma and flavor - dry and mild - very good. Nut Brown Ale: Light roasted malt and nut flavor - dry. K.B. Porter: Slight roasty aroma and flavor. Oatmeal Stout: Dark brown with light chocolate hints. Salt Lake Brewing/Squatters Pub is just around the corner from Red Rock. They feature a nice pub menu with nachos, soups, sandwiches, grilled meats, pizzas, and desserts. Many menu items include beer in the recipe. There is a pleasant patio out back, and a big house beer menu. Hefeweizen: American wheat with fruit and a spicy German wheat character. Provo Girl Pilsner: A slightly buttery lager with Magnum hops. Chasing Tail Golden Ale: Light gold in color, sweet, and mild. Vienna Lager: Dry and mild. Emigration Amber: A good ale with Centennial and Chinook hops. Full Suspension Pale: A dry-hopped ale that has won gold medals in the past. Millcreek Cream Stout: Pale caramel, chocolate malts, roasted barley, and Chinook hops. Espresso Stout - rich coffee flavor. IPA: Mild and in need of more hops. These beers we sampled in 2004 were not as good as our last trip in 1999. They were all too mild in flavor for their respective styles and all had a bit of vegetal off-flavor. We are sure head brewer Kevin Templin will work this out. This brewpub is a wonderful place with great history. 1700 South 389 West, ph:  801-467-0909. Uinta makes some clean, light-bodied beers that manage to have a lot of character. Be sure to visit their taproom when you are in Salt Lake (M-F 9am to 5:30 pm, and Sat. noon to 5 pm). To the right is a picture of cellarman and lab guy, Chad Allen. Uinta has been going for five years as of 1999 and sells beer in all of Utah. Right around the corner from Uinta Brewing. This is a photo of the Wasatch tasting room where patrons can sample and purchase cases of the company's products. Wasatch has a nice pale ale, amber ale, and many other tasty beers. When we visited, we were also lucky enough to try their seasonal beer -- Jupiter Peak Belgian White (very delicious and authentic). The hours of the tasting room vary in the afternoons, so be sure to call ahead if you can. Bohemian Brewery and Grill, 94 East Fort Union Blvd., Salt Lake City, 801-566-5474. Hoppers Grill and Brewing Company, 890 East Fort Union Blvd., Midvale, UT, 801-566-0424. Bayou Beer Bar, 645 South State Street., Salt Lake City, 801-961-8400. Brewvies Cinema Pub, 677 S. 200 W., Salt Lake City, 801-355-5500.